Alan Murray has spent most of his adult life studying and teaching philosophy, and this is reflected in his poetry. Many of the poems here are concerned with the idea of the ‘self’ and the contradictions it gives rise to, but they are all rooted in everyday experience, and are often intimate and conversational, even when written in strict form. His poems offer the perfect balance of head and heart, with tender love lyrics and elegies alongside the sometimes serious, sometimes tongue-in-cheek metaphysical musings. 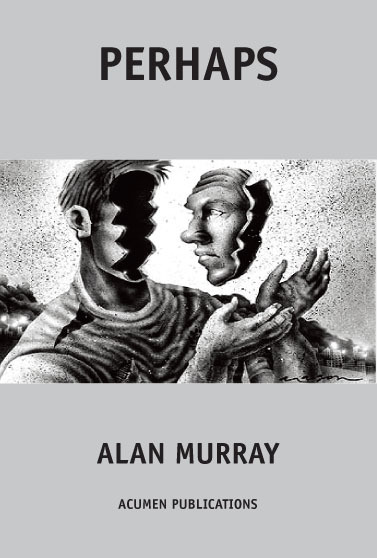 “Perhaps is Alan Murray’s Acumen chapbook from 2013 and it quotes Nietzsche’s observation that the word ‘I’ is the point at which our ignorance begins and several poems do press at the boundaries and mysteries of the self. Murray is a philosopher as well as poet and his colloquial, skilfully turned verse sounds Larkinesque in its precision and equivocations. Great to read poems unafraid of complex ideas” – Martyn Crucefix. “…such a wonderful read, [the] poems have a remarkable light touch yet carry such a profound sense of humanity. I have to say that they are the sort of poems that make me feel that amongst some poets we can find our ‘tribe’, those who know what it is to look at life, our lives, and see something others may recognise but have no words for or something that might pass us by. Can’t wait to read that full collection when it comes along” – Andrea Porter. “The Image on the cover is a face broken off, turned round, looking back to what is behind itself. No written introduction could be more eloquent. Murray explores interior monologue. In ‘On Self Deception’, “in that sordid, dimly lit back alley of the mind”, the interior narratives of different selves conduct ‘ethical debates’. Riveting conversationalists they make, and he revels in the conundrums…It takes effort to appear effortless…This collection earns it ‘personal force’ (Whitman) quietly. Every poem turns on a light in that shadowy alley of the mind” – Lynne Taylor in Orbis. “Murray’s sardonic wit make this a must for every poetry lover” – Wendy French. “Alan writes wonderfully precise, crisp poetry – that stays with you long after you have heard it” – Simon Bowden.